There have been some impressive athletic feats accomplished lately. Kenyan Runner Eliud Kipchoge came 25 seconds away from breaking the 2 hour marathon during an orchestrated attempt in Monza, Italy in May. Oklahoma City Thunder point guard Russell Westbrook actually averaged a triple-double (as well as led the league in scoring) this season. 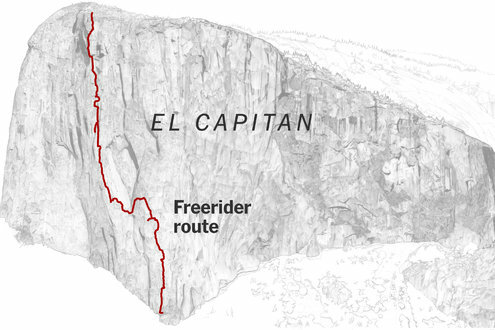 But, with a bit less fanfare, rock climber Alex Honnold free-solo-climbed the Freerider route of Yosemite’s El Capitan. El Capitan (or El Cap) is what the climbing community has dubbed the sheer 3,000 foot face of the famed Half Dome rock in Yosemite National Park (pictured above). Solo free climbing means doing it alone and without any ropes or protective gear (pro). Just climbing shoes and chalk. Today, knowing that it has been done, I think that is a fair assessment of the significance. It’s a generation-defining climb. In terms of mental mastery, I am convinced that it is one of the pinnacle sporting moments of all time. That would be akin to climbing up a natural rock face two times at tall as the Sears Tower knowing that one slip would mean plummeting to your death. He did it in just under 4 hours, which is stunningly unbelievable both because of how short and how long the time period is! He’s climbed the Freerider at least a dozen times and practiced the most difficult sections to the point where he likely would have been able to do them blindfolded. But free soloing is a feat less physical than mental. Beyond the obvious factors of vertigo inducing exposure and unexpected obstacles (think breaking rock and birds flying out of cracks), hard granite climbing requires such precision that one must be completely lucid. I have no point except to admit my own amazement at what Honnold accomplished. Virginia Postrel wrote an OpEd for Bloomberg about the importance of the narratives our nation adopts. She keys off of the tragic stabbing that took place on the Portland MAX light rail system, where three men sought to intervene in a situation where two female passengers were being threatened and verbally accosted. Two of these men were fatally stabbed by the deranged white-supremacist. One was critically injured. It is natural to focus on the vile actions of this violent perpetrator, but there is another story to tell. America is about a Republican, a Democrat, and an autistic poet putting their lives on the line to protect young women from a different faith and culture simply because it is the right thing to do. Cultures are held together by stories. We define who we are — as individuals, families, organizations, and nations — by the stories we tell about ourselves. These stories express hopes, fears, and values. They create coherence out of complexity by emphasizing some things and ignoring others. Their moral worth lies not in their absolute truth or falsehood — all narratives simplify reality — but in the aspirations they express and the cultural character they shape. Evil forces are always stirring in our world. There are times when they surface from the dark deep in obvious and tragic ways. But, tucked in around these eras and their events, there are also always the most stunning human exemplars. These deserve attention and imitation. I would recommend reading her short piece. It resonated with me. How a nation with such inequality can practically function, let alone not be sucked under by growing mass discontent is hard to conceive. It was this discontent, of course, which became the fulcrum for the 2016 general election. But it is clear that neither party has much to offer in addressing this. Inequality divides us, cleaving us into camps not only of income but also of ideology and race, eroding our trust in one another. It generates stress and makes us all less healthy and less happy. The flip side of this is that self-interest must be constantly placed in check. The levels of inequality in our own society verge on exploitation, and the recent histories of Enron, Bernie Madoff and those complicit in the sub-prime mortgage crisis (among many others) show that unchecked greed results in an enormity of human suffering and hardship. Kristof is always a good, humanitarian voice. I just hope our nation can understand the urgency of this, and not keep falling prey to fear-based populist rhetoric. We do need a reboot, but we need the right kinds. This article in the Guardian by Reni Eddo-Lodge contains some of the most helpful material I’ve read on racism and its structures. She speaks from the standpoint of a British ethnic minority, and her experience and viewpoint mirror that of many American minorities. Several years ago Eddo-Lodge wrote a blog post titles “Why I’m No Longer Talking to White People About Race”, which went viral. This article is her follow up. Structural racism is dozens, or hundreds, or thousands of people with the same biases joining together to make up one organisation, and acting accordingly. Structural racism is an impenetrably white workplace culture set by those people, where anyone who falls outside the culture must conform or face failure. This is what structural racism looks like. It is not just about personal prejudice, but the collective effects of bias. It is the kind of racism that has the power to drastically affect people’s life chances. Structural racism is about how Britain’s relationship with race infects and distorts equal opportunity. I think that we, as a nation, placate ourselves with the concept of meritocracy, and by insisting that we just don’t see race. This makes us feel progressive. But to claim not to see race is to demand compulsory assimilation. Colour-blindness does not accept the existence of structural racism or a history of white racial dominance. Indulging the myth that we are all equal denies the economic, political and social legacy of a British society that has historically been organised by race. For a more developed picture, you really need to read the whole piece. There is an option to either listen to the article or read it, and I would recommend doing so. It might be helpful to to simply read through this thinking, “How would I do if I lived in a society where my way of doing things was abnormal and where my color of skin became a subtle (or not so subtle) vetting criteria for my own enfranchisement?” How would you handle that? Drawing heavily on a new book by Fordham University criminal justice expert John Pfaff, German Lopez critiques the common view that the drug war is the cause of racially discriminant mass incarceration. It’s not drug offenses that are driving mass incarceration, but violent ones. It’s not the federal government that’s behind mass incarceration, but a whole host of prison systems down to the local and state level. It’s not solely police and lawmakers leading to more incarceration and lengthy prison sentences, but prosecutors who are by and large out of the political spotlight. Based entirely on the article, I think Pfaff often misses the forest for the trees; failing to understand the interconnectedness of the criminal justice machinery and failing to connect meaningful dots. That is to say, I don’t fully agree with the thesis. But grappling with the causes and realities behind this sad American phenomenon is an important task. As was mentioned in this week’s Economist, prisons “make bad people worse” (I don’t love that language). No one truly knows a nation until one has been inside its jails. Mass incarceration and our criminal “justice” system do not bespeak a healthy nation. This article does thoughtfully suggest how we might start backing our way out. It’s an informative read.